just feel it's important to let others know of my experience. I was originally skeptical about purchasing the VillaWare 2010 from Deal Yard; however, they had relatively good reviews, so I went ahead with the purchase. I was delighted to receive my waffle maker in a very timely fashion and in the manufacturer's box including warranty, directions, and all the usual goodies. We have been really pleased with the performance of the waffle maker thus far. 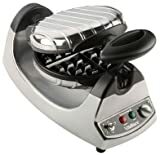 It creates thick Belgian waffles that do not stick or tear during removal. The audible alarm is wonderful; it lets us know when the iron is hot and when the waffles are ready. We have had to set the timer to a setting higher than that recommended by the manufacturer, but have consistently turned out golden brown, crunchy-on-the-outside, tender-on-the-inside waffles. Clean up is fast and easy, just wipe out the crumbs. We've tried a recipe from Alton Brown that was quite tasty as well as the jalape?o and cheddar recipe in the instruction manual. The waffles are so thick, that I am considering ice cream and fruit toppings. The only problem we've had is that we can't seem to make full waffles. We get Belgium diamonds. The problem might be solved by increasing the batter per waffle, but the diamonds are large enough for us. Overall, I think this product is great and would recommend it to anyone. This is our fourth "Gravity" waffler. We have not experienced the early heating outage reported by others, though our third one died in the middle of Sunday morning breakfast after many years of faithful once-a-week service. Yes, Belgian waffles EVERY Sunday morning--a ritual! Our first two Gravity wafflers suffered from a flimsy projection that freed the rotating assembly to rotate. The third one never had this problem, and the fourth one has shown no hint of it either, after a month or two. The built-in timer is almost useless, unless you like undercooked waffles. We like ours crispy and lightly browned on the outside, and still moist on the inside, so I crank the heat all the way up and cook the waffles for 4.5 - 4.75 minutes. Krusteaz makes a terrific Belgian waffle mix, which I supplement with vanilla extract, almond extract, and usually a small amount of lemon extract. Then we drown them in 100% pure maple syrup and occasionally wild blueberries and Cracker Barrel's wild blueberry syrup (actually, Dickinson's syrup that we buy at Cracker Barrel). The Gravity waffler makes the tallest waffles of any wafflemaker I've been able to find. 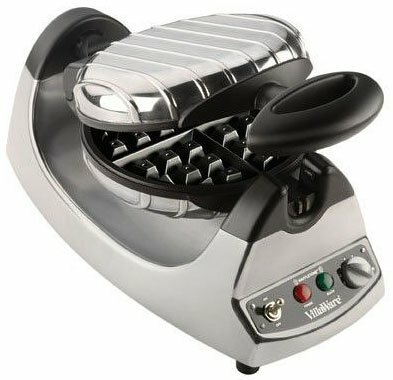 The construction is much more solid than the Waring "flip" wafflemaker, and the staff at Williams-Sonoma said that the WillaWare Gravity wafflemaker significantly outperformed the much more expensive Kitchenaid wafflemaker. Yes, it's huge and takes up a lot of cabinet space. Our previous waffler was a regular VillaWare round waffler that made the same diameter waffles, but not as tall. The old waffler had a footprint of about 2 inches x 8 inches and about 8 inches tall, so it would fit almost anywhere. The Gravity waffler is 15 inches wide by 9 inches deep by 9 inches tall!